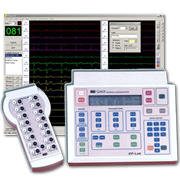 The Physio-28 Polygraph is a High resolution System with 12 surface ECG and 16 intracavitary channels with a built-in stimulator for all kind of electrophysiology studies. The system runs on any Windows PC. This platform provides robustness and safety to all the control processes. Likewise, it supports concurrent tasks during the study (protocol selection, report generation, graphic representations, review of previous studies, and so on). The entire study can be stored for further retrieval. The study review is fully functional, including the visualization of channels not present on the screen during the study. The physician can also review other patients studies stored in the database of the system.